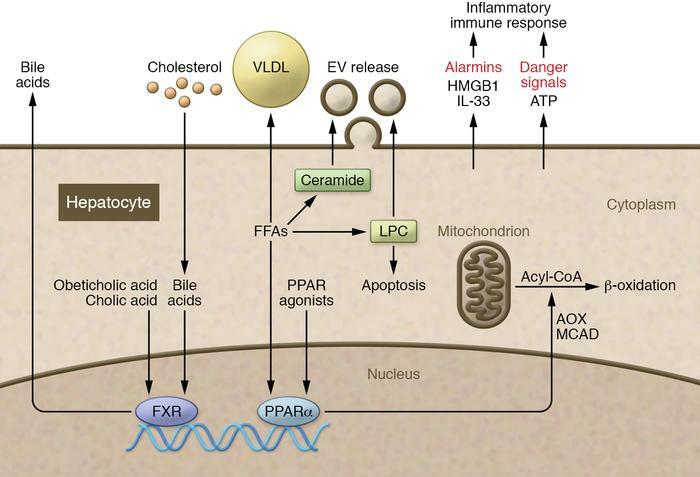 An overview of lipid metabolism in hepatocytes. Hepatocytes become steatotic as a result of increased de novo lipogenesis, decreased β oxidation, and decreased VLDL secretion. Free fatty acids (FFAs) such as palmitate can induce the formation of both ceramide and lysophosphatidylcholine (LPC). LPC can activate proapoptotic signaling and lead to extracellular vesicle (EV) release. Palmitate-derived ceramide also induce EV release. HMGB1 and IL-33 are alarmins that are released from hepatocytes in the pathogenesis of chronic liver diseases, including nonalcoholic fatty liver disease. PPAR stimulation facilitates oxidation of lipids by upregulating acyl-CoA-oxidase and MCAD. Thus, PPARs are possible therapeutic targets in nonalcoholic steatohepatitis. FXR signaling facilitates secretion of bile acids and decreases hepatic lipid synthesis and enhances peripheral clearance of VLDL. AOX, acyl-CoA oxidase.